Every Brahmin in Tamil Nadu and Kerala like people in all other states of India believe that in their life time , they should at least once visit Allahabad, Varanasi and Gaya and give sacred oblations to their ancestors. Only people who have started performing Sraddhas to their father can do this. Other people no doubt can visit these places and visit the most holy temples there but cannot do the rites to the ancestors. It is essential for the people with such intentions to do it in the proper religious way and go there accompanied by their wife (if she is alive) and do it without being exploited and do it as comfortably as possible. If younger brothers accompany the elder brothers, the eldest brother on their behalf would do most of the ceremonies and the younger brothers need not do these ceremonies again. The first step in this pilgrimage is to go to Rameshwaram, perform the Sraddha there, followed by Samudhra and Theertha Snana. After doing Samudhra Snana, we would be instructed to bring sand from the sea. This is made in to three Siva Lingas-Sethu Madhava, Veni Madhava and Bindhu Madhava. After pooja the Linga representing Sethu Madhava is put back in to the sea. The priest then asks you to repeat the Sankalpa to the Varanasi-Prayag-Gaya pilgrimage. The sand lingas of Veni Madhava has to be deposited in the Prayag (Allahabad) and that of Bindhu Madhava in Varanasi. Then Sraddha to the ancestors is performed there. Instead of Pinda (cooked rice balls) in this place the pinda is made of wet uncooked rice. It is essential to plan this journey in advance. Rainy season, late Summer and Winter are not very suitable for doing a comfortable pilgrimage. The ceremonies is then be done in Allahabad (1 day) , Varanasi(A minimum of two days) and then in Gaya(minimum one day). Please note that the ceremonies in Gaya take about 6 hours starting in the morning. given So It is essential to reach Gaya in the morning. People who know Gaya warn us not to leave the railway station before day break. Since theft is rampant in the train, it would be better not to carry any costly ornaments . Buddha Gaya which is 10 miles from Gaya is a nice tourist spot. If reservation is done by night train from Gaya to Varanasi, this can also be visited . The priests in Varanasi help us to conduct these in a proper way. They also help us to conduct the ceremonies at Gaya where they have to depute a cook with materials to help us perform Sraddham there. It is essential that we come to an agreement on the charges for performing the ceremonies at Gaya and Varanasi with the priest in Varanasi.They also provide us rooms for stay and food (on separate charges) on all the days. And help us arrange for transportation. On all the days of the stay it is essential that we take rice food only once and take Palaharams in the evening. The charges vary a lot. When we went there , we heard rates from Rs6000/ for a package to Varanasi and Gaya to Rs.30000 to 50000/-. This does not include boat and transport charges and expenses on travel and food. 2.Mani Karnika snanam After this we are taken in a boat (charges extra) to Manikarnika Ghat.Near Manikarnika Ghat is the Chakra Theertham.After Bathing in Manikarnika Ghat we have to bathe in Chakra Theertham also .It is believed that Lord Vishnu created this Theertham even before Ganges started flowing and did Thapas there for 50000 years. There is the temple of Bindhu Madhava near this Ghat This temple also needs to be visited(you have to put one part of sand brought from Rameswaram here).. Also the biggest and holiest cremation Ground in Kasi is adjoining this Ghat. 3.Hiranya Sradham After this one Hiranya Sraddham is performed. 1-3 are performed continuously and take about 2-3 hours. 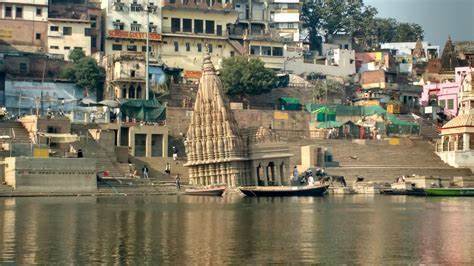 2.Dashwamedha Ghat –The Rudra Sarovar mixes with Ganga in this ghat. 3.Varuna Ghat- The waters which washes God Vishnu’s feet is suppose to merge in Ganga in this Ghat 4.Pancha Ganga Ghat- Here the waters of the five rivers of Dharmanadha, Dhoodhapapa, Kirana, Ganga, Yamuna and Saraswathi is suppose to merge.It is believed that the bath here is holiest. 5.Mani Karnika Ghat After performing the Pinda Pradhanam(preparing cooked rice, forming in to balls and then telling the manthra with sprinkling of Thil and offering it in the Ghat), we are taken to each Ghat . Like Prayag here also seventeen Pindas are made each time. By the time one reaches the next ghat, the pinda for that Ghat is cooked and gets ready. In each ghat we have to take bath and do Pinda Pradhanam. .This is repeated till we do the ceremony in all the five Ghats. Bathing in some Ghats have become very difficult due to the extreme slippery nature of the Ghat and the depth of water near it. In such Ghats Sankalpa snana is performed. 5.Ganga Pooja ( 5-6 Normally after the Gaya visit) This is the worshipping of the river Ganga.It is believed that before this we visit the temples of Lord Kasi Viswanatha, Goddess Annapurna, Goddess Visalakshi, Lord Kala Bhairava,Lord Dhanda Pani, Goddess Kaudi Bai, Durga Kund, Sankat Mochan Hanuman and other important temples. (Please note that visit to these temples is at our expense and does not come under the contract amount) The pooja is directly performed to the river ,Oblations of Milk , Curd etc are directly poured in to the river besides Coins. It is also a practice to offer new Vasthra (nowadays blouse pieces) to the river. 6.Dhampathi Pooja An old learned couple is worshipped as God and Goddess. Normally Veshti and Angavastram to the male and 9 yards sari to the wife is given. It is a practice to give the Lady whom we worship all the signs of a sumangali like Thali, Bangles, metti, Comb, Mirror etc,This brings to an end the ceremonies at Varanasi , Gaya and Allahabad, .This Pooja is preferably performed after the Sraddha at Gaya .People who can afford can also do Dasa Dhana, Godhan etc because it is considered that done at Varanasi they are very efficacious. This pilgrimage is complete only when along with the Ganga water collected from Prayag we again visit Rameswaram and do Abhishekam to Ramanatha Swami there. Since seeing pigrims who returned from Varanasi pilgrimage is Punya, after coming back, arrange for a Ganga pooja , call all relatives and friends , and after pooja distribute Ganga water as Prasadam. The most famous religious city of Uttar Pradesh, Varanasi is the sacred city and one of the most visiting destination in India. I like it very heartily and have visited many times. Recently, I was visited with Bharat Taxi and enjoyed the entire city and famous destinations there. Great article, It is a nice article provide a best tour option and experience.. Awesome! It is too good post. It helps a lot to visitors. There are number of temples that you must visit. And, some of them are the Durga Temple, the Jantar Mantar, the Kashi Vishwanath Temple, the Sankat Mochan Temple, the Mahatma Gandhi Kashi Vidyapith, the New Vishwanath Temple on the BHU campus, the Ramnagar Fort, the Riverfront Ghats, the Tulsi Manas Temple. And you can easily hire local car rental provider in Varanasi and ride all over the city. Thanks for sharing information, it help us a lot for our varanasi tour. Golden Triangle Tour with Varanasi is one of the best option to see real india tour at short time period. This tour package cover the three cities and Varanasi also. Golden Triangle Tour with Varanasiis the way by which you can get the beautiful things or can explore the culture and history of India. Delhi, Agra, and Jaipur these cities are really very rich in culture and history. In this article you quickly clarify the entire visit guide of Rajasthan. Pleasant article and photographs are additionally astonishing. A debt of gratitude is in order for this astonishing article. Good Blog with good Pictures, i really like it.We provides Tempo Traveller in Delhi ,Tempo Traveller in Gurgaon , Tempo Traveller on rent in Noida , Tempo Traveller on rent in Ghaziabad , Tempo Traveller on rent in Faridabad , Tempo Traveller,Tempo Traveller rent faridabad,Tempo Traveller rent gurgaon,Tempo Traveller in Faridabad,Tempo Traveller on rent in faridabad for easy travel. Very useful to us information via blog.Chardham Tour Agents in RISHIKESH . We are Chardham Tour Operator in RISHIKESH-Haridwar .Our Best Packages Chardham Package,Teendham Package,Dodham Package,Dodham PackageEkdham Package,Chardham Helicopter Package.